The college-educated among these young adults are better off. But nearly 17 percent are either unemployed or not seeking work, a record level (although some are in graduate school). The unemployment rate for college-educated young adults, 5.5 percent, is nearly double what it was on the eve of the Great Recession, in 2007, and the highest level — by almost two percentage points — since the bureau started to keep records in 1994 for those with at least four years of college. Yet surveys show that the majority of the nation’s millennials remain confident, as Scott Nicholson is, that they will have satisfactory careers. They have a lot going for them. “They are better educated than previous generations and they were raised by baby boomers who lavished a lot of attention on their children,” said Andrew Kohut, the Pew Research Center’s director. That helps to explain their persistent optimism, even as they struggle to succeed. Mr. Nicholson, 24, a graduate of Colgate University, winner of a dean’s award for academic excellence, spent his mornings searching corporate Web sites for suitable job openings. When he found one, he mailed off a résumé and cover letter — four or five a week, week after week. A 24-year-old man is more fearful of a parental lecture than unemployment. If that doesn’t capture the dreary state of able-bodied America, nothing does. Meanwhile, this same person, living off of mom and dad, is so certain of his worth on the job market, he won’t consider pocketing an expense-free annual $40,000 because it requires dead-end work. Wait. You mean he found a job with the national underemployment rate at 16.5%, with no professional work experience, that paid $40,000 per year, and didn’t take it because it wasn’t exactly what he wanted? There must be some confusion here about the American Dream. The idea that every 24-year old lands their dream job straight out of college isn’t the American Dream: it’s a fantasy. Anyone who grew up throughout the 20th Century could attest that the American dream isn’t about always getting precisely what you want. It’s about taking what life hands you, working extremely hard, and having the ability to live a relatively satisfying life. Millions immigrated to the U.S. over the years seeking an opportunity to succeed, not to be provided precisely the opportunity they wanted. Look back at those Americans of past generations who lived the American Dream. Did the coal miner who had a brutal job but decent wages that allowed him to provide for his family live the American Dream? How about the worker who drove railroad spikes into the ground under the hot sun all day? What about the factory employee who sat on a monotonous assembly line for hours on end? They all attained the American dream, because they had an opportunity to work, raise a family, earn enough money to live relatively well, and find some joy in life. They may have preferred to be a professional golfer, a famous novelist, or high-powered corporate executive making millions of dollars per year. But not everyone has such luck, but in America they can live relatively fruitful, pleasant lives nonetheless. Certainly, millennials will have a different job path than their parents and grandparents. It will likely take them longer to gain their footing in the labor market. But that hardly means they’re hopeless, it just means they will have to work a little harder to end up in a job they like and attain a higher income. They won’t be able to walk into any manufacturing jobs and succeed like their predecessors, but they will have opportunities in technology, the service economy, and other U.S. industries that will endure. The American Dream that so many other nations envy isn’t to live a perfect life. It’s to have the opportunity to succeed if you work hard. You don’t get that in some places, but you do in the U.S. The millenials won’t lose out on that, but they may have to work a little harder to attain it. 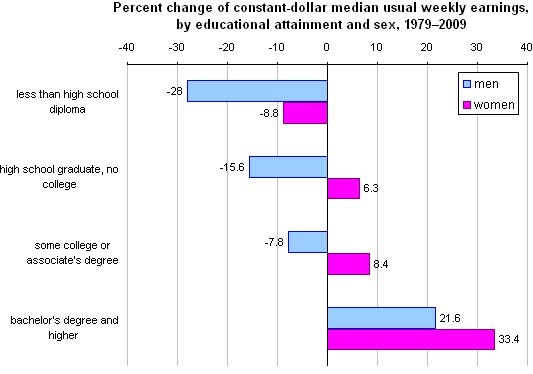 The chart above, adapted from a recent Bureau of Labor Statistics report, shows the difference in weekly pay between people with a given education level today and their counterparts from a generation ago. There are a few forces behind these trends. One is that generally speaking, it’s harder to make it in today’s job market than it was a few decades ago if you don’t have at least a high school degree, since the expectations for what educational credentials workers should possess have risen. This is in part because the economy is less dependent on lower-skilled, manual-labor-intensive industries like manufacturing, and more reliant on industries that require formally credentialed education and training, like health care. Thus, in general, the earnings potential for the most educated has risen, and that for the least educated has fallen. Another consideration is that the gap between men’s and women’s pay has narrowed over the years. One effect of this is that women’s wages, at most levels of education, have grown. But in fact what we’re seeing here understates how bad things have been for most men over the past generation. If you go to the source, this chart only shows data for people working full time. And, at least when it comes to men, that’s much less common now than it was in 1979. The labor force participation rate for men 20 years and older was 79.8% in 1979; today, it’s just 74.4%. And I don’t think that most of that drop can be explained in terms of a larger number of students: the rate was as high as 77% as recently as August 2000, and then dropped to a low of 73.9% in December 2009. You can be sure that most of the drop in labor force participation is coming from the less well educated Americans. Which means that if you’re a man with less than a high school diploma, your real wages have fallen by 28% over the past 30 years if you’re lucky enough to have a job at all. At the same time, the number of such men without a job has been growing steadily. It’s a depressing set of data, and there’s no sign of it turning around in the foreseeable future. What I would also add to that is the observation that college educated men typically marry college educated women, creating very high earning households. Working class people tend to marry each other, and also have much higher rates of divorce, meaning that on the household level the inegalitarian impacts are magnified. In 1979, most married women stayed at home with the kids or simply tended house; that almost immediately changed. And, while being a high-school dropout wasn’t exactly a road to riches even then, there were still entry level jobs that would take you and allow you to work yourself up if you were good enough. Why, “self-service” was still a necessary descriptors for gas stations that didn’t have attendants to pump it for you. The personal computer was a novelty item and the Internet as we know it was nearly 15 years into the future. Americans are more educated than ever before, with a greater percentage graduating from high school and college than a decade ago, U.S. Census data released Tuesday show. Eighty percent of Americans are graduates of high school or higher, compared with 75.2% in 1990, the 2000 figures show. That change came about in part because of a decline in the rate of students dropping out before ninth grade: 7.5% in 2000, compared with 10.4% in 1990. That report, based on the 2000 Census, came out in 2002. It’s almost surely even more stark now, at least for native-born Americans. That’s not to say that these trends are sustainable. We can’t keep increasing our level of meaningful education. Everyone isn’t college material or capable of doing intellectual work. But the nature of modernity is that more skills are necessary to do median level jobs.